Columns inside the RadGridView are resizable by default. The user is able to easily change the column width by positioning the mouse over the columns vertical grid line and dragging it until the desired size is achieved. There are two ways to disable the resizing. 1. The first one is by setting the CanUserResize columns to False. This will disable resizing on RadGridView level, which means that all of the columns won't be resizable. 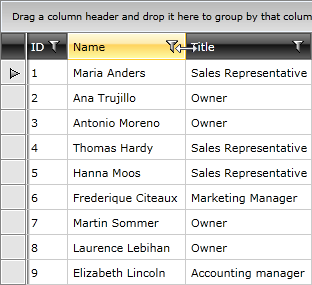 If you want to disable resizing only for a particular column use the IsResizable property of the column. When the user resizes the column the ColumnWidthChanging event is fired and if it is not canceled the ColumnWidthChanged event fires after the resize is completed. Read more here. The user can resize columns only if CanUserResizeColumns is set to True (this is its default value).